Deciding whether or not you trust the labels and certifications on any coffee packaging is up to whom you trust. After over a year of researching and living coffee, I’m only beginning to form my own personal opinions. Here are links to the official sites outlining the missions and methods of the non profit organizations and for profit companies who are behind the logos you see on your coffee packaging. You don’t have to be on the ground to be as informed as possible. All of the certifications below correspond to non-profits who work to develop sets of standards. All of the auditors mentioned below are for-profit companies, and they are the ones who charge auditing/inspection fees to the farms/co-ops looking to become certified. FLO-CERT , itself accredited and “monitored by a third 3rd party agency,” is the auditor (Certification Body) that inspects farms against the Standards set by Fairtrade. Fair Trade USA recently split (bitterly) from Fairtrade International. The premise of the split was so that FT USA could certify larger estates as well as groups of smallholders, and also help independent smallholders develop producer organizations by encouraging them to work with local non profits acting as Market Access Partner. The verdict is not yet in on either the true motivations/goals or the results/effectiveness of the broader inclusions. FT USA observes the same price floors/premiums as Fairtrade International, and parties already certified by Fairtrade International need only submit their certification paperwork to FT USA have both certifications. Roasters with both certifications can then choose which logo to use on their products depending on the markets of final sale. SCS Global Services is the auditor (Certification Body) that inspects farms against the Standards set by Fair Trade USA. Rainforest Alliance is concerned with the protections of ecosystems and biodiversity in the name of sustaining people and planet. The Rainforest Alliance certified farms must meet the Standards of the Sustainable Agriculture Network. 5 Accredited Certification Bodies are “authorized to provide Rainforest Alliance certification based on SAN standards.” The first Accredited Certification Body, Sustainable Farm Certification International, in turn authorizes 10 Inspection bodies to carry out on-the-ground farm audits. UTZ is similar to Rainforest in its holistic approach to coffee. Many large co-ops in Colombia have UTZ certification. It’s much more commonly seen (and recognized) on European coffee packaging. No one I worked with in Latin America had any “official” certifications for Shade Grown or Bird Friendly coffee. Those terms are far less regulated than the other labels above. The Smithsonian Migratory Bird Institute does have a stamp, but these “labels” are much harder to enforce than Fair Trade price premiums or testing the soil to see if any herbicides were used. 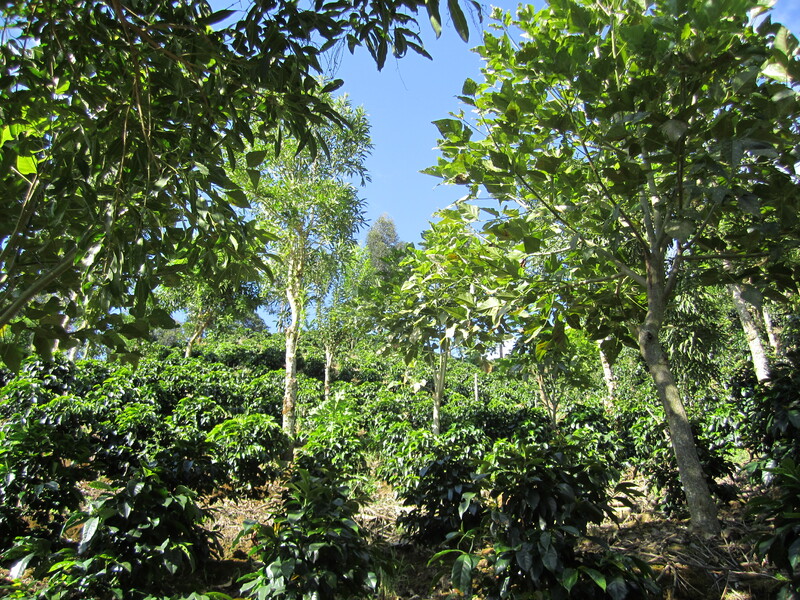 Shade Grown and Bird Friendly coffee exist in the grey areas of agroecology and agroforestry. Just how many trees do you need before they constitute “shade?” What kinds? How tall do they have to be? What if you cut them all down one year to sell for extra money because the coffee price is still so low?How many birds do you need before a place can be considered “friendly” to them? Pretty much any farm with Rainforest Alliance certification will be bird friendly and shady because RA certification requires the planting of trees, preferably native species. “Shade Grown” is a difficult criteria to strive for, because some varietals of coffee actually perform better in full sun; the shade as sun protector is not necessarily the desirable quality; the trees as root-makers and erosion-preventers is probably their most attractive trait. Miguel’s farm is Rainforest Alliance certified. It has lots of (shady) trees and birds. Direct Trade The entire purpose of direct trade is that it transcends traditional certification labeling. But, explaining yourself and how you took a flight, a bus, a pickup truck, a donkey and a pair of muddy boots to go have rice and beans with the little Colombian family who you bought your prized coffee beans from takes time and a lot of text. It’s much easier to just slap a little direct trade logo on coffee packaging or coffee shop windows. Direct Trade just might be having its Animal Farm moment, becoming what it sought to replace. But, in theory, Direct Trade circumvents all middlemen (except the inevitable shipper/importer. We all need our pirates; coffee can’t apparate.) and establishes a direct relationship between roasters and growers. This is much easier in theory than in practice, and the large volume of coffee a roaster needs, the harder it becomes to maintain interpersonal relationships with farmers in the far corners of the world. It’s possible, but you have to really want to do it to do it. Most direct trade roasters forged said interpersonal relationships in the first place in order to get their hands on high quality coffee that was traditionally being mixed in with all grades of mediocre and crappy coffee. The intentions and motivations are complicated at best, convoluted on average, and shifting every day. In general, the smaller the company the more it actually knows about the coffee it roasts and sells. Denomination of Origin Some coffees are going the ways of wines (and even cheeses) in verifying the exact region whence come particular coffees. There is something special about certain “magical” growing regions, and those regions want to protect their coffee. They’re tired of watching other people profit from the success of the name they spent generations building a good reputation for. But producers are divided as to wether pursuing Denomination of Origin labeling is worth the time and money it requires. Read more in my article “To Certify or Not to Certify?” for Tea & Coffee Trade Journal March 2013.